Louie enjoying his appointment with Dr Schilling. 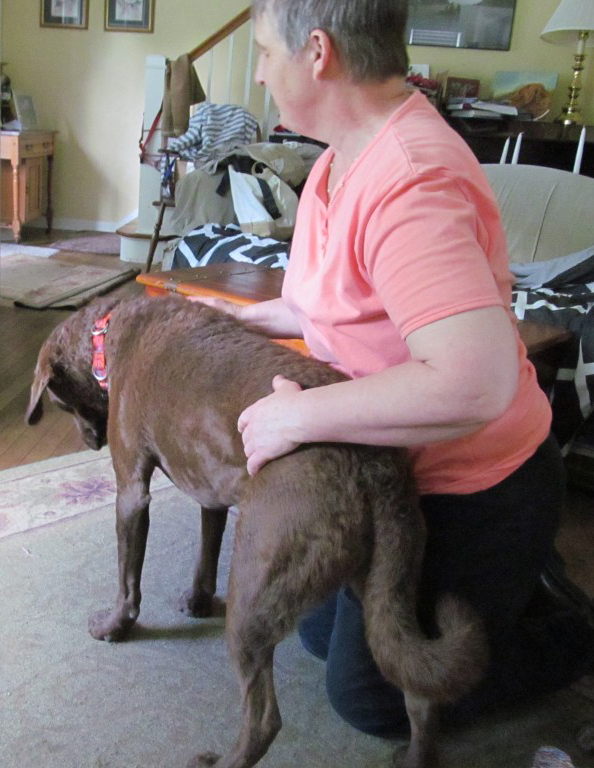 Hour long appointments and a home like atmosphere allow animals to relax making Veterinary Spinal Manipulation easier, more effective and longer lasting. It also improves the patient’s attitude about coming for a visit! The timing and number of treatments required to resolve a problem depends on the condition being treated and the severity of the problem. A schedule of weekly treatments for two or three weeks is common. Chronic problems will require ongoing maintenance. To make an appointment with Dr. Schilling to help your four legged friend, please call 608.638.6380 or 608-632-1441. Please see note below about call completion issues. You can email me by clicking on the blue “email Dr. Jan” button in the right side of the page. Be sure to add my email address to your address book so my reply doesn’t get sent to junk mail. House calls and farm visits are available with in a 70 mile radius of Viroqua, WI. Monday, Tuesday, Wednesday, Friday: appointments available in Viroqua, WI and through out south west Wisconsin and south east Minnesota. Evening appointments may possible to accommodate work schedules. Saturdays: Appointments are available on most Saturday mornings, 9:00 to 11:00. The third Wednesday afternoon of each month I will be at Fun Fur Pets at 1404 Green Bay St, in La Crosse, WI. My next visit is April 17th. Third Wednesdays for 2019 are January 16, February 20, March 20, April 17, May 15, June 19, July 17, August 21, September 18, October 16, November 20 and December 18. Call me at 608-638-6380 or 608-632-1441 to make an appointment. You can email me at DrJanatVet-Energydotcom (please use the @ symbol for “at” and . for “dot”). Your furry friends will thank you. I have become aware that some people trying to reach me using their cell phones (especially Sprint/Boost Mobile customers) are experiencing what is called “rural call completion failure”. For more info visit http://reedsburgutility.com/phone/call-completion-issues for an easy to understand explanation. My land line is set to go to voice mail after four rings. If you call me and don’t get an answer or my voice mail after 5 or 6 rings you are probably not going to get through. You have three options two try to reach me. 1)email me by clicking on the blue “email Dr. Jan ” button on the right side of the page or at drjanatvet-energydotcom using the appropriate symbols for “at” and “dot”. 2) If you still have access to a land line that is a good way to reach me. You can leave a cell phone number for a call back if you wish. So far the land line to cell phone calls don’t seem to be a problem. Please make sure your voice mail is set up and has room in it. 3) If your only option is a cell phone and you can’t get through to 608-638-6380, you may leave a message on my cell phone, 608-632-1441, BUT because I have poor cell service here I will be using the cell phone as a remote voice mail and you may not hear from me the same day you leave a message. Again please make sure your voice mail is set up and isn’t full. Texting is an option, but again, don’t expect rapid response times. 608-632-1441. If you are experiencing call completion failures REPORT them to your service provider and on line to the FCC. Get more info at FCC.gov. Vernon Communications is having issues with voice mail on my land line. If you get blank air your modem needs to be updated. Call VCC to let them know you are having issues. If you leave a message and I don’t get back to you in 24 hours I didn’t get the message. Please call back.